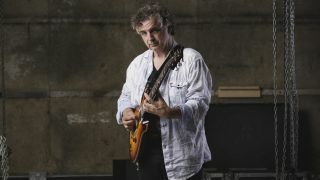 King Crimson guitarist Jakko Jakszyk has reflected on his favourite moment since joining the band. He hooked up with Robert Fripp and co in 2013 and when asked about his highlight from the last three years with the band, he points to playing 21st Century Schizoid Man with his idols onstage. Jakszyk tells Sound Review: “I think it may well be standing on stage at the end of the band’s first appearance in Albany in upstate New York. King Crimson haven’t released a studio album since 2003’s The Power To Believe – but Jakszyk hints that new material could be around the corner. King Crimson released their live package live package Radical Action To Unseat The Hold Of Monkey Mind earlier this month, with the band’s live dates set to continue in Europe in November.